DALLAS, Oct. 25, 2017 (GLOBE NEWSWIRE) -- Masergy, a leading provider of hybrid networking, managed security and cloud communications solutions, today announced the Masergy Communicator HUB. The new offering, greatly improves worker productivity by organizing on a single screen, all contextual information relevant to a call such as notes, emails and shared documents--instantly captured from Google Suite, Microsoft Office 365, Salesforce, Twitter and other collaboration applications. 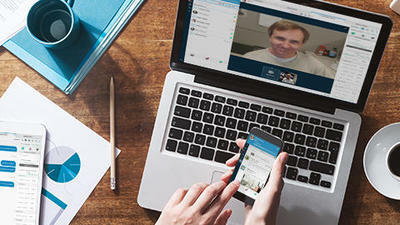 "Masergy's latest Contextual Communications innovation, introduces a more productive way of working by instantly displaying difficult-to-locate information, giving employees and guests a streamlined way to collaborate on all relevant call data across any device - (desktops, tablets, and smartphones)," said Dean Manzoori, VP Global Cloud Communications, Masergy. "With Masergy Communicator HUB, employees will spend less time trying to connect to information and more time communicating." Masergy Communicator HUB is bundled with the company's award-winning Global Unified Communication as a Service (Global UCaaS) solution, to provide integrated business phone services, messaging and presence, audio and video conferencing, screen sharing, file sharing, virtual meeting rooms and more. Today's announcement is another example of Masergy's ability to show continuous innovations in unified communications as a service--without the need for forklift upgrades. Masergy Communicator HUB is currently available and offered as a complementary upgrade to the company's Global UCaaS customers. Masergy owns and operates the largest independent Software Defined Platform in the world, delivering hybrid networking, managed security and cloud communication solutions to global enterprises. Our patented technology, customizable solutions and unmatched customer experience are why a growing number of leading organizations rely on Masergy to deliver performance beyond expectations. Learn more about Masergy and follow us on our blog Transforming Enterprise IT, [email protected], LinkedIn and Facebook. \"Masergy's latest Contextual Communications innovation, introduces a more productive way of working by instantly displaying difficult-to-locate information, giving employees and guests a streamlined way to collaborate on all relevant call data across any device - (desktops, tablets, and smartphones),\" said Dean Manzoori, VP Global Cloud Communications, Masergy. \"With Masergy Communicator HUB, employees will spend less time trying to connect to information and more time communicating.\"